Organic. 100% European sunflower seeds. Unrefined & cold pressed. Rich in vitamin E. High in polyunsaturated fat. Kosher.Clearspring organic oils are made from the highest quality organic ingredients, which are cold pressed without chemicals to ensure the best nutrition and flavour. 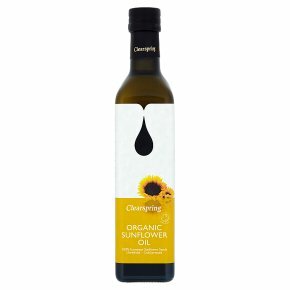 Light in taste and appearance, sunflower oil is ideal for salad dressings, low temperature cooking and for use in heavily spiced dishes.